This article is about the historical town in Crimea. For the settlement of Stary Krym lying east of Mariupol, see Mariupol. Staryi Krym (Russian: Старый Крым, Ukrainian: Старий Крим, Crimean Tatar: Eski Qırım) is a small historical town and former bishopric in Kirovske Raion of Crimea, an area currently disputed between Russia and Ukraine. It is located in the Eastern Crimean Peninsula, approximately 25 km (15 mi.) west of Theodosia. Population: 9,277 (2014 Census). During the 13th century, the town was known as either Solkhat (Solkhad, Solghad, Ṣulġāt صلغات) or as Qrım (al-Qirim القرم). Both names are unattested prior to the 13th century, but on the authority of al-Qalqashandi, Solkhat is the older of the two, dating to the period prior to the Mongol conquest. The origin of either name is uncertain. Some consider Solkhat to be related to the Greek Colchis. Both names coexisted during the 14th century, but the name Qırım came to displace Solkhat by the early 15th. Before the Mongol period, mention is made in Greek hagiography of the residence of the Khazar governor of the eastern part of the peninsula, as a fortress named Phoulla or Phoullai (Φοῦλλαι, although other sources identify this place with Chufut-Kale) along with Sugdaia (Sudak); it is likely that the site of this fortress corresponds to the site of Solghat. The name Qirim may continue the old name Cimmerium (after the Cimmerians). The Strait of Kerch was known as Bosporus Cimmerius in the Roman era (as reported by Ptolemy, Polybius, and Strabo), after the city of Cimmerium which stood nearby. The promontory or peninsula on which it stood was known as Promontorium Cimmerium (Κιμμέριον ἄκρον). The 13th-century toponym Qrim is likely explained as a corruption of the name Cimmerium. There are however alternative suggestions, such as derivation from the Greek Cremnoi (Κρημνοί, in post-classical Koiné Greek pronunciation, Crimni, i.e., "the Cliffs", referenced by Herodotus 4.20.1 and 4.110.2) or from a Mongolian appellation. The name "Crimea" (for the Crimean Khanate, and later also for the peninsula itself) is derived from the name of the city. It became adopted as an alternative term for what used to be known as Tauris or Tauric Peninsula in western languages from the 17th century. 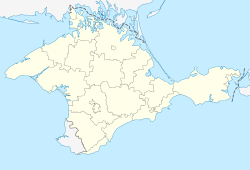 Since the annexation of Crimea by Catherine II of Russia in 1783, the town has been known by the Russian name Staryi Krym (Russian staryi meaning "old", rendered in Crimean Tatar as eski; also transliterated as Staroi Krim and variants). Although officially the town was renamed Levkopol after the ancient Greek name of Leukopolis (White City), this never gained popularity, perhaps because the town already styled a name from antiquity. The town was probably the site of a Khazar fortress before the Mongol conquest. The Mongols under Batu Khan fortified the town and thereafter it became a capital of the Crimean Yurt (Crimean province of the Golden Horde) and a home for the Emir of Crimea. Before the 1270s, Qrim had been a village surrounding a fort at best, but by the early 14th century it had grown into a prosperous city. Kaykaus II was give Qrim as a fief in c. 1265. Tatar coins were struck in Qrim from 1287/8 (AH 686) and in the same year, an Egyptian architect was sent there to build a mosque to be named after the Egyptian sultan. From that period remain the Ozbek Han Mosque, built in 1314 by Uzbeg Khan, and the ruins of a madrassa built in 1332. The town prospered during the 14th century, but it was completely destroyed during the civil unrest under Mengli Girai in the later 15th century. Qrim seems to have retained its position as capital of the newly established Crimean Khanate for some years, as coins struck here are dated to as late as 1517 (AH 923), after which point the capital of the Ottoman vassal state was moved to Bakhchisaray, and the city declined into relative obscurity. After the Russian conquest of the Crimean Khanate in the 1770s, the city of Stary Krim was given the Greek name of Leukopolis (Lewkopol), but this name never entered common usage. Stary Krim was the city where the famous Russian writer Alexander Grin lived and died, and now has a museum dedicated to him. The city is home to an important cardiac sanatorium, formerly run by notable heart surgeon Nikolai Amosov. As Phulli, it was one of the bishoprics in the Roman client-state, later province, of the Bosporan Kingdom, where no imperial metropolis was established, and it faded under heathen rule. The diocese was nominally restored in 1929, as a Latin Catholic titular archbishopric (Curiate Italian name Fulli). ^ Perhaps a Turkified form of the Italian name Solcati (Italian: solcata – furrow, ditch). An alternative proposal derives it from the name of an Armenian monastic complex in Staryi Krym, built in 1338 and known in Armenian as "Surb Khach," Armenian: Սուրբ Խաչ or Holy Cross. [unreliable source?] Maksoudian, Krikor (1997). "Armenian Communities in Eastern Europe" in The Armenian People From Ancient to Modern Times, Volume II: Foreign Dominion to Statehood: The Fifteenth Century to the Twentieth Century. Richard Hovannisian (ed.) New York: Palgrave Macmillan. p. 57. ISBN 1-4039-6422-X. ^ a b c d E. J. Brill's First Encyclopaedia of Islam, 1913-1936, Volume 4, pp. 1084f. ^ Cimmerium. Encyclopedia Britannica 4th edition (1810). ^ Adrian Room, Placenames of the World, 2003, p. 96. .
^ Edward Gibbon, The history of the decline and fall of the Roman Empire, Volume 10 (1788), p. 211: "The modern reader must not confound this old Cherson of the Tauric or Crimean peninsula with a new city of the same name". ^ "Crimean Tatar Architecture". International Committee for Crimea. Retrieved 2011-02-20. Wikimedia Commons has media related to Staryi Krym. The murder of the Jews of Stary Krym during World War II, at Yad Vashem website.